mileME is a productivity SaaS & app for hands-free mileage logging worth over $2,000 in after-tax income for an average business driver. The secret sauce enables mileME to always be on, sensing velocity and automatically logging miles. mileMe also correlates trip logs to calendar. mileME $39.99 yearly membership pays for itself in75 miles. Do you drive your car for business? Do you deduct or expense your miles? Do you keep a written log of your trips that would satisfy an IRS audit? 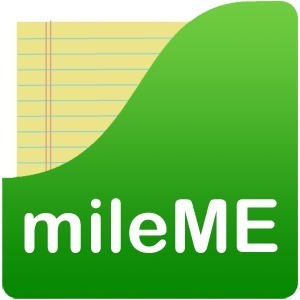 mileME is a productivity app for hands-free mileage logging. An average driver could add over $2,000 in after-tax income by automatically logging miles. mileME checks velocity. When you’re moving mileME takes a location fix. When you stop mileME takes a destination fix to automatically create a trip log. You never touch your phone, turn it off, turn it off, plug it into the charger or connect it to your call. Yet mileME automatically logs your miles. mileME also automatically matches your trip log to your calendar, again you do nothing else. mileME utilizes financial level encryption to keep your data private. We don't sell or trade member data. mileME automatically backs up member data to the cloud should your phone be lost or stolen. 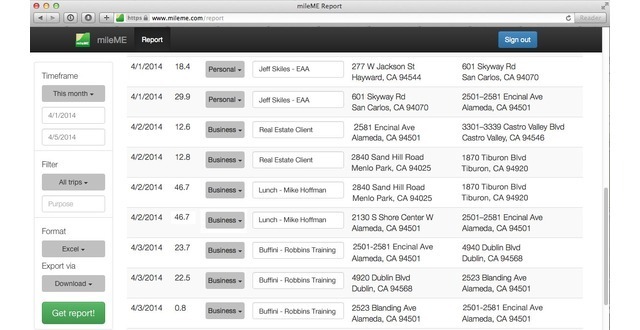 You can edit your log on the website and have mileME automatically prepare a report for your taxes or expense report. Co-inventor/ co-founder Cobaltcard.com patented online and offline stored value payment, acquired by AmEx (2000) then First Data Corporation (2007.) Co-founder iPrevail, Inc. patent litigation support, acquired by FTI Consulting (NYSE) in 2005. If you drive 12,000 miles a year for business you could be passing up about $6,600 a year in deductions, or about $2,000 after tax income. Standard deduction is 55 cents per mile for business. Often an employer reimburses only gas or a fixed monthly fee. Your annual mileME service will pay for itself in less than 75 miles of standard IRS deduction. mileME is free to try for 45 days on iPhone and Android. Annual service is $39.99 or you can pay $3.99 monthly. The value proposition for field sales and service is obvious: Companies benefit when their top producers are focused on selling and serving customers, not filling out reports. Automating expense reporting, a vital financial requirement yet one of the most annoying field sales activities, has a huge payoff. No more nagging, more accurate logs, more productive sales reps.
mleME is software as a service (SaaS), enabling automated export from our server to customized reporting forms for corporate expense systems such as Concur is designed into our model. Let us know your requirement. Imagine the IRS as your business partner, literally creating a pain point for over 16 million Americans while rewarding taxpayers with reduced taxes if they use your service. Those 16 million taxpayers use their personal vehicle for business, charity or medical use to claim over $102 billion in deductions each year. Those deductions reduce taxes in excess of $22.3 billion, an average deduction of $6,375 per driver, a tax saving of $38 per week or $2,000 per year per taxpayer. IRS data suggests an average of 215 miles per week, over 178 billion miles a year by all taxpayers. Taxpayers have difficulty maintaining the habit of a written trip log as required by the IRS or the corporate expense department. Our primary research revealed that approximately 3% of self-employed drivers keep an accurate log of every business trip. The majority "estimate" their miles or "approximate" their miles by extrapolating a percentage of annual vehicle expense. There was also a large minority cohort who merely guessed. Note: this data does not include deductions on various corporate returns for 1065 Partnerships, LLCs, S-Corporations and C-Corporations. The IRS does not require line count details necessary to identify vehicle use for these returns. Our primary research indicated that taxpayers behaved much like someone who is overweight and could use help creating a habit. They didn't want to guess or approximate, but there was no question they had "better things to do" such as talk to a customer rather than keep a written log. We also tested or evaluated many of the existing products and technologies on the market. These included fleet tracking "tattlers," as well as devices plugged into the vehical computer port that could download data to a smartphone but could not distinguish trips. We found dozens of mobile apps for keeping notes, some of which used GPS. Our testing showed nearly all required the driver to remember to pull out the phone, open the app, enter 6-25 characters to identify the purpose of the trip, and pressing a "start" before moving the car. We soon discovered that these apps ran GPS at all times that quickly drained the battery. So the app developers advised plugging the phone into a charger while driving. Add machine learning on the server side of the SaaS model where we can identify patterns and minimize driver reporting tasks while maintaining accuracy. The company mission is automating valuable business processes with machine learning. Many of these are the connections between the Internet of things, human habits, and big data. mileME automates a financial liability for large and small businesses with a mobility platform and machine learning. The founders have deep experience in location sensing, enterprise process automation and payment platforms. Imagine you could automatically log your miles by doing next to nothing. No buttons to start or stop. Nothing to plug in. Nothing to speak. No added device to your car. The mileME app runs in the background on your smartphone, sensing your velocity, noting the origination and destination of your trip. At the start of a trip in your car you literally do nothing with mileME. mileME is quietly checking your motion and then noting the start location. When you end your trip, you again do nothing. mileME will automatically update your log in about 5 minutes. Ignore your phone in your pocket or purse. You don’t need to look at the app, touch the phone or do anything, and mileME will log your trip. If you schedule a meeting with your calendar mileME automatically correlates it to your trip log. Machine learning on the server also enhances automated categorization through pattern matching with your past trips. You can set up automatic exports of your mileage log for expense report or tax filing. mileME is completely hands-free mileage logging. Your log is automatically backed up to the cloud so you can edit or export a log for your expense report or tax records. Encrypted cloud storage also protects your log if your phone is lost or broken. We use financial level encryption to protect your data. It's your data, not ours. We don’t sell, trade or share your data. We also archive your encrypted data, with your permission of course, for up to four years should you need it for an audit. Once you install and launch the mileME app you can literally focus on your most productive tasks like talking to clients on the phone, traveling to meetings, preparing for winning contracts and ignoring mileME while it logs your miles. Have you ever noticed that GPS drains your battery? 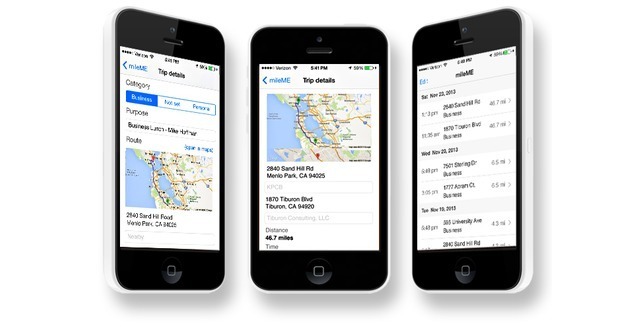 mileME is built around our proprietary software that does not rely upon GPS for location. mileME uses about 1% as much power as GPS, so mileME can run all the time in the background. mileME also has proprietary machine learning on the server side to further automate categorizing trips and sorting locations. The algorithms are designed to learn patterns over time to differentiate business from personal use, Client A from Client B, and simplify sorting. The mileME platform also enables export to a variety of reporting systems. The standard report is exported as an Excel file (.xls). Many corporate employees are requesting export to .xml that is compatible with Concur and other corporate expense reporting systems. mileME features end-to-end financial level data encryption to protect our members' data. We do not sell or trade member data. mileME was featured in a VatorNews article: "The five finalists for OakTown Tech Startup Competition"